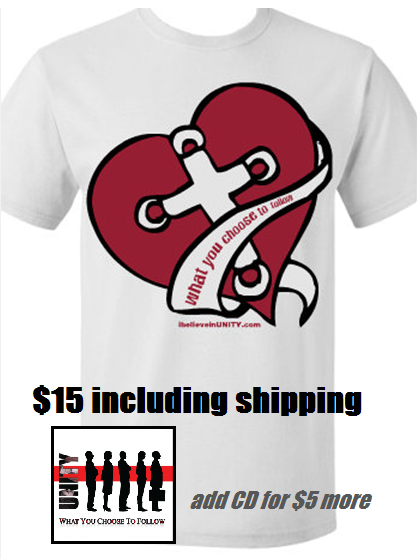 Purchase our t-shirt for $15 including shipping/handling. Add only $5 more for a physical copy of our CD (the cheapest price available). Simply send the money via the PayPal link below specifying size and address and your item(s) will be shipped within 2-3 business days. Thank you for supporting the ministry of UNITY! Send $15 for tshirt alone. Send $20 for tshirt + CD. Send $10 for CD alone. Remember to specify size and address in comments.